Donald "Donal" Dinnie (of Aboyne) competed in this event at the age of sixteen and had "the pick of the prizes." This is according to a biography of Dinnie from 1900. It lists that Ross beat Donald Dinnie (of Scotland) in these events. Dinnie putted the stone: 43 feet, 7.5 inches. He threw the hammer; 101 feet, 7 inches. From an interview with Duncan C. Ross in 1893. 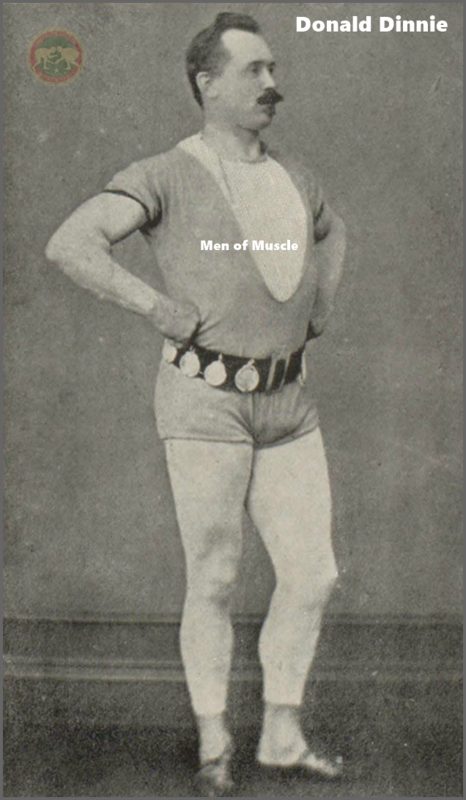 When Miller won the fifth fall he fractured his ankle and was unable to continue for the last round of Scotch wrestling. The match was called a draw. Donald Dinnie quit after the fourth fall due to an injured shoulder. Also featured Professor Miller, Donald Dinnie, J. Connor, M. Nathan, J. Hall, J.E. Donegan, Morris Ewins, Brady, Thunderbolt, Lawless, Wiggans, Miss Etilo Ray, James Crilly, Frank Furmegan, Tom Leverant, Frank Campbell, Mr. M'Bailley, Percy Hall, Circassian Youth and General Tom Thumb. Christol & Cannon are both listed as being of America and Christol the "Masked Wrestler of Paris." It is noted though that Cannon was actually born in Lancashire, England, but has been a resident in the States for some years. Also featured Tom Cannon, Donald Dinnie, Jack Connor, Andre Christol, Wm. Thornton, M. Caffrey, Tom M'Kenzie, D. Ford, T. Tichner and A. Smart, as well as boxing and a dog show.